Netanya is a fascinating blend of reminiscence, fiction, and amateur science, seeking to convey not only a personal story but the big picture in which the saga of life on Earth and of the stars that surround it have the same status as anecdotes about one’s aunts and uncles. With a tip of the hat to W. G. Sebald and Yoel Hoffmann, Netanya seeks to transform human history into an intimate family story, and demonstrates how the mind at play can bring a little warmth into a cold universe. The “plot” of Burstein’s dazzling meditation consists of nothing more than the author’s lying on a bench, looking up at the night sky. What results from this simple action is, however, a monologue whose scope is both personal and cosmic, with Burstein’s thoughts ricocheting between stories from his past and visions of the origin and end of the universe. An enthralling work of literature, accessible and exciting. 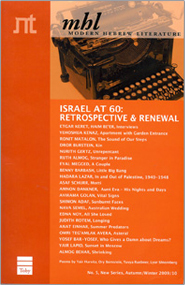 Netanya is the most profound, beautiful, multi-layered book of Burstein`s to date. Dror Burstein is one of the most gifted writers in Israel.